I’m going to be completely upfront: I never touch my brows. Even though in the past I’ve purchased the infamous ABH Brow Wizz and Benefit’s Gimme Brow (the UK’s No 1 selling eyebrow product) both have rolled around the bottom of my dressing table drawer for over a year now, untouched and unloved. My brows have just never been part of my daily routine and, in all honesty, no matter how many YouTube tutorials I watch, I find them a little bit intimidating. I mean, where do you begin? 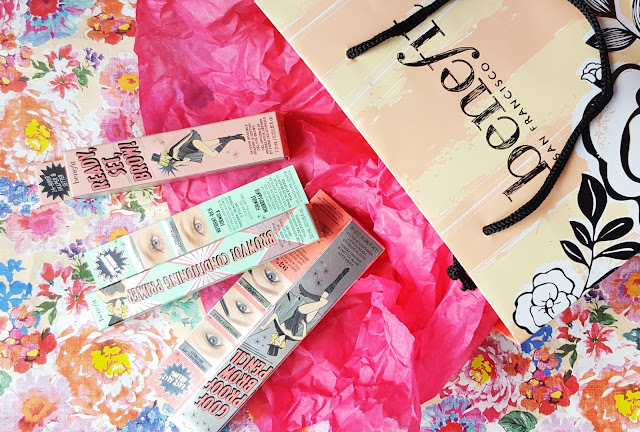 Thankfully, I was invited to my first ever blogging event, the relaunch of the Benefit Cosmetics Brow Collection at House of Fraser, Glasgow and received a thorough brow education. 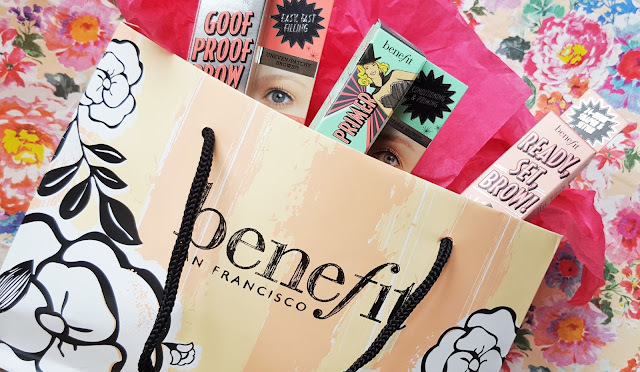 Benefit have been solving brow related dilemmas ever since they opened their first boutique in San Francisco in 1976. Now, with 1800 BrowBar beauty lounges in 49 countries, Benefit is the world’s leading brow authority. 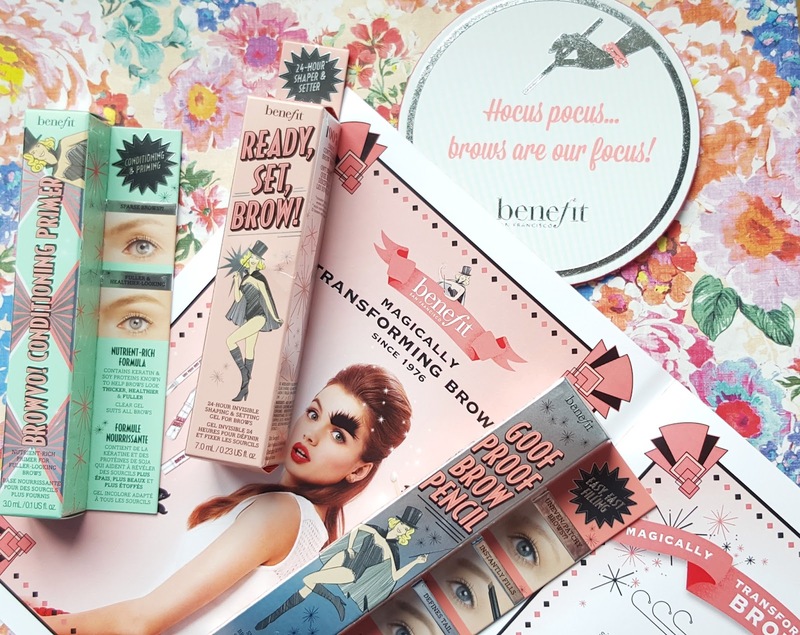 This month Benefit are re-launching their brow collection which now includes 36 beautifully packaged products and tools containing a new generation of formulas and shades to suit everyone’s brow needs. 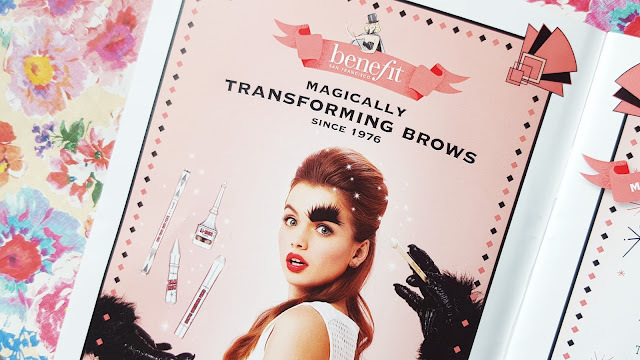 I was lucky enough to get the opportunity to play around with all the products in their new ‘magic’ inspired collection and pose all my brow related questions direct to the lovely Benebabes themselves. So, Benefit’s iconic volumising fibre gel has had a bit of a makeover but, don’t worry, it’s still the product you’ve come to know and love. The award-winning brush-on gel still contains the same tiny microfibres that adhere to skin and hair to create fullness and definition but, due to popular demand, is now available in three shades, including a new natural-looking medium shade. You may have already had the opportunity to snap this super easy brow-filling and shaping pencil up thanks to ELLE Magazines recent issue. This is one of my favourite products from the whole collection. I’ll have a full review up for you to read very soon but basically the soft, glide-on formula, the shape of the tip and the choice of six natural-looking shades, makes defining your brows super easy. Goof Proof is the perfect starting product for a brow novice like myself to invest in. I feel like if you are already accustomed to defining your brows and are looking for a product a little more accurate and professional looking than Good Proof this could be the one for you. This ‘ultra’ defining waterproof pencil creates precise incredibly realistic hair-like strokes and is available in six smudge-proof shades. 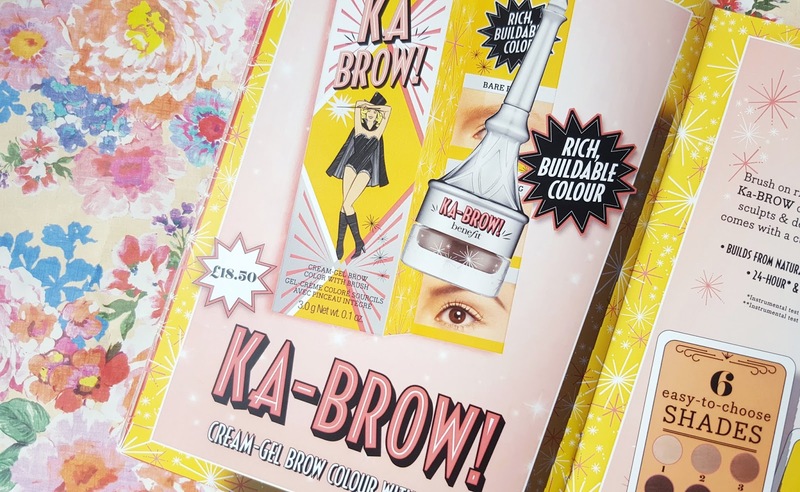 Yes, it was bound to happen, Benefit have now released a primer for your eyebrows. This nutrient-rich primer contains keratin and soy proteins to help brows look thicker, healthier and fuller. An old favourite and bestseller, Brow Zings is a pocket-sized compact that includes a perfectly paired wax and powder, mini slanted tweezers and a new extendable dual-ended brush; basically everything you need to tame and shape your brows on the go. A very pretty and unusual product, which I had no idea what the hell to do with at first. Ka-Brow! comes with a tiny pot of highly pigmented gel-cream and a custom built in brush to sculpt and define brows. It’s incredibly buildable depending on what look you’re going for and lasts for an unbelievable 24 hours. This is definitely a product a brow beginner like me aims to build up too. Another of my favourite products was this 14-hour invisible shaping and setting gel. It’s custom-molded wand is the perfect size for precise application. The gel holds your brows in place and locks on makeup. It can be worn over your makeup or alone for a quick and easy way to control your brows without adding any colour. Another bestselling oldie, these highlighting pencils now contain a new creamier, blendable formula. The super soft formula is really pretty and instantly highlights your brow arch for brighter and younger-looking eyes. The collection basically has everything you need to magically transform your brows at home. Whether you have skinny brows, patchy brows, barely there brows or are a brow beginner, enthusiast or professional – this collection has something for everyone! I personally love the weighted feel and sleek silver packaging of each product. The magical theme throughout the entire collection works unbelievably well at bringing the whole collection into one consistent collection, and although the thought of 36 products may seem a little daunting at first, I love how it caters to all abilities and skin tones. It was a tough decision, but after talking to the lovely Benefit staff and playing around with all these gorgeous products, this brow novice decided to pick up the Goof Proof Pencil, Ready, Set, Brow! and Browvo! 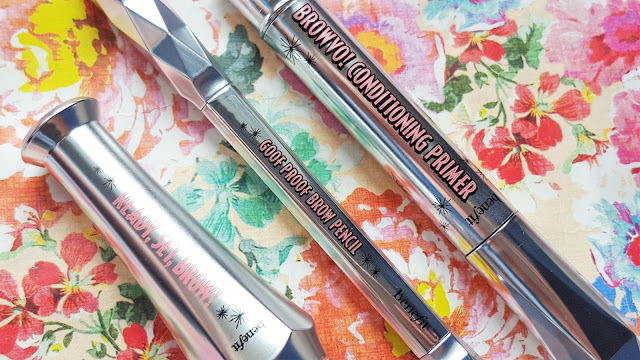 Conditioning Primer, all which I cannot wait to try and review in more depth – let my brow obsession begin! P.S. If you’re unsure of which shade is right for you just pop by a Benefit counter for a consultation service. Which product from the NEW Benefit Brow Collection are you most looking forward to trying? "June’s BBQ Degustabox | The Surprise Food Subscription Box (£6 Off Promo Code)"
"Morphe Brushes Single Eyeshadows in ES33 Wink for Pink, ES70 New Moon and ES54 Glisten | Review & Swatches"